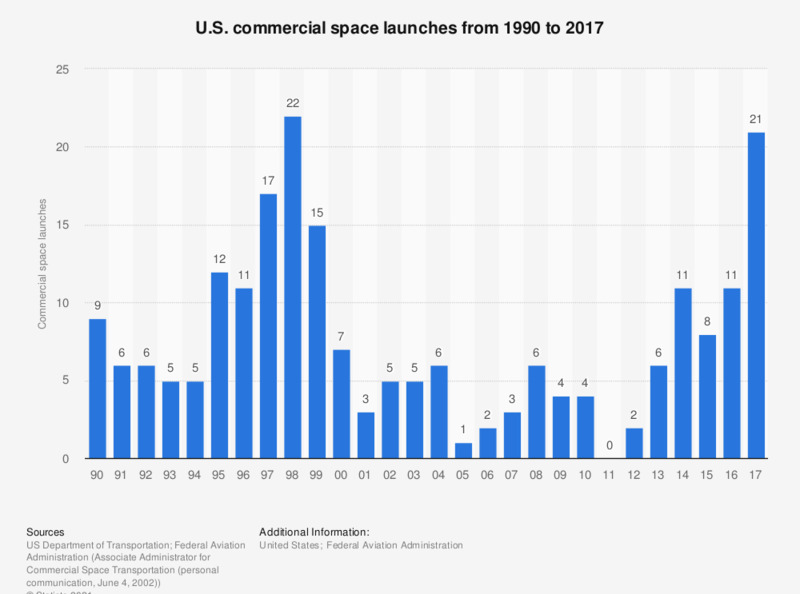 The graph depicts the number of U.S. commercial space launches from 1990 to 2017. The United States conducted 21 commercial space launches in 2017. Between 1990 and 2017, this figure amounted to 213. Data through 2015 were taken from the Bureau of Transportation Statistics' website. 2016 figure was taken from a previous edition. A commercial launch is a launch that is internationally competed (i.e. available in principle to international launch providers) or whose primary payload is commercial in nature. FAA-licensed launches carrying captive government (NASA and DOD) or industry payloads (ORBCOMM, Delta 3 demosat, Zenit 3SL demosat, and others) are counted here. Data are for orbital launches only.